Destin Water Activities – So Many Choices! There’s nothing like a day out on the water. While deep sea fishing is our most loved water sport, our intracoastal waterway is also popular for small crafts. There’s a never ending variety of things to do in Destin, FL. The waterway is a terrific location for water activities such as paddle boarding and dolphin cruises. 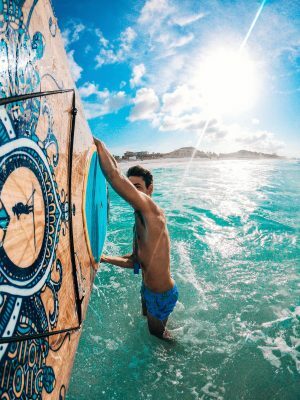 GUSU Paddlesports – GUSU is a terrific starting point, offering paddleboard, surfboard, and kayak rentals. GUSU also offers lessons with professional instructors. Boards and kayaks can be rented by the hour, day, or week. GUSU is an acronym for Get Up, Stand Up. Kitty Hawk Kites – Down on the Destin Harbor, Kitty Hawk Kites is not just a kite store. It’s another source for board and kayak rentals. You can also rent a GoPro camera to record your fun. Crab Island Dolphin Tours – Do you want to leave the navigating to someone else? Crab Island Dolphin Tours is the perfect solution. Captain Wayne Burnette will captain your vessel and manage your water adventure. Crab Island Dolphin Tours also rents pontoon boats and waverunners. If you’re looking for something extra-special, the company also provides dolphin tours, fireworks or sunset cruises in Destin, Florida. Destin Snorkel – Destin Snorkel has something for everyone with its variety of tours. Do you want to go shelling or see fireworks? Here are the options: two-stop snorkeling, SNUBA®, shelling/dolphin, dolphin/sunset and fireworks tours. Dockside Watersports – Dockside will rent you a pontoon boat or fishing boat for your day of fun. Dockside is also a great place to rent jet skis. If you need a guide out on the water, they have the folks who can also take you out and search for dolphins. Do you need a photographer for your fun in the sun? We can highly recommend local photographer Jesse Foy of Foytography who is terrific at adventure photography & beach photo shoots. Here is a link to his website and you can also you can find Jesse’s work on Facebook under Foytography.